SAM & I traveled to Saugatuck/Douglas, Mi Wednesday, leaving early, to meet up with Dan & Kathleen on S/V Kathleen. We arrived just before lunch, which Kathy served up, and after a brief catchup of the past year we planned our work for the afternoon. The weather was cool and the sea fog was rolling in by the tonnes but Thursday weather promised bright skies and warmer inland temperatures. Dan and I started on the radio project to check out his antenna system and then install a Standard Horizon Matrix 2000 VHF/GPS/AIS unit. 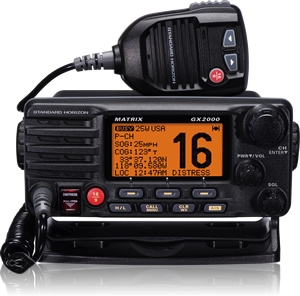 This DSC radio is very cool and reasonably priced at about $400±. The antenna system checked out good with the old DSC radio reading 21W forward and about 2.5W reflected. Not too bad for a boat system. I mostly lent Dan moral support and watched while he did all the work on the install. Well, actually, I played with his new chartplotter / sonar unit. I did find out the sequence to adjust the depth offset so the chartplotter depth agreed with the standard depth guage so I guess I held up part of the bargain. Prior to the real install we made a mock-up of the place below decks that the radio was to be installed to determine if the radio would receive the GPS signals: the GPS receiver must be very sensitive because it worked well and agreed with the chartplotter position. After we got the unit installed I checked the power output of the transmitter and it was 19W forward with 2W reflected so it agreed with my previous readings. After this we played with the radio and I must say the audio was excellent. This is on my purchase list. Today, Thursday, we took Kathleen out on Lake Michigan for a few hours but the winds were 5 – 8 Kts so it was not a real good sailing day. The further we went out the worse the winds became and the lumpier the 2’ seas became. Water temperature was 55°F in July. This is a cold year on the water. We had a great chat but soon it was time to make the three hour trip back to Indiana. D&K promised to visit us this winter towards the end of February – Yea. We cannot wait to have them aboard Inspiration II. I have been dreaming lately. More and more of my dreams are of sailboats and specifically, of Inspiration II. I dream of all the work to be done this Fall and Winter. I dream of all the materials I must collect and take with me to the boat. I hope she does not sink after loading all this “stuff”. I started a “Ship’s Log” yesterday. It has 10 sections that deal with items needed to manage a live-a-board vessel for several months at a time. Now I need to generate the document forms for each section. For example, Section 1 will have a form that lists Time, Date, Vessel status (in port, mooring, under sail, motoring, person on duty and position reports plus other elements of interest to the vessel and authorities. Section 1 is the day to day log of all activities of being onboard. Section 2 is all about Maintenance & Repairs. Section 3 deals with Fuel status, concerns and hours of operation of the two diesel engines. Section 6 is a catchall Miscellaneous grouping. I need to get motivated to generate some ham radio related project like getting the AllStar operational on a BeagleBlack and IRLP on a PiIRLP board. This will reduce the size to a form factor suitable for the boat. Right now I think I will work on the forms for each section of the Ship’s Log. Bye. Here are some pictures from this years Balloons Aloft event this year that was held on July 11, 12. Another great event thanks to Walt and Marsha, et. al. Ok, so I recovered from the password adventure. Now what? Well, I bought a Dell Precision T5400 w 2x 4 core Xeon processors. a full win 7 32/64 bit disc set with COA and a cheapy reactivation code for a Win 7 Home install. At this point all are operational. The Dell Precision I bought from eBay arrived and it was much heavier than I expected. In addition, when I pulled the cover plate off it is extremely tightly packed. Working on it is not your usual Dell Optiplex experience. In fact, it is down right uncomfortable except if you are in a Precision expert. Perhaps I will become one but it will not be without travails. Spent the afternoon on this beast. Still to come – clone the 160GB HDD for the future fail – and then clone it to a 500 or greater HDD. It is a nice machine. Really. Before the Precision, I took an old Dell Latitude D620 with Win XPP and applied a face lift with a new life of Windows 7 Home. It installed OK with a full format install and is not too slow. Unfortunately, I found out later that the replacement battery I bought a couple of winters ago is kaput. Therefore, it is a run without battery only and this is a disappointment. Anyway, jobs are all done and I am going to relax a bit. The Friday Night Net on IRLP is on so I have to go. Bye. Oh oh, recovering Dell w Win 7 64 Bit. This happened when the auto-update did not perform correctly. A word of wisdom: make a thumb drive with the password restore on it and make a repair disc. I had neither for the 64 bit install so I was sad for a while. BTW – this was a two account machine but the other account only had standard user rights – which means I could not change someone elses account password. I installed the original 64bit install disc and managed to back off the last update and – walla – the password was my normal one. I this whole process I generated another account that has admin rights so if it ever happens again I can for a start log into that account and restore my password. This week all started with a little project to make a couple of old Dell GX270’s run again. I have three and just wanted to make one run so I could use it to connect to my downstairs HP Deskjet 5510 All-In-One printer. I did not want to junkup my Win 7 Ultimate machine with a XP throwback driver by making the machine run in XP mode. The Deskjet is connected to our “home” phone – which is a VOIP connection – so I can send faxes whenever is necessary. So, I had the machine up and running pretty quick but then decided to clone an old IDE drive to use in machine #2.The #2 cloned drive went pretty smooth using WDD Acronis software. However, the drive would not boot – I guessed the MBR was missing or corrupt – so I started down a path that has taken all week and an end is not in sight. I am now on my third clone of the #2 drive using an iso of the Acronis backup utility. This is happening as I write so we shall see.Needless to say, there have been hundreds of interruptions while this whole process was going on so I do not feel too bad that I cannot focus and just get the job done…Oh ya, did i forget to say that my eBay mistake arrived? Yes, it is here and just sitting majestically and awaiting to confound me even moore :): It is a Dell Precision T5400 with x2 Xeon quad core processors, graphics card, 8Mb RAM plus dual 160MB HDD’s. I think I will RAID them just for fun. However, I need a legit copy of Win 7 Professional (or at least a COA number) to activate. WAITING NOW!—- -still waiting and bought a full version Win 7 Pro for the Dell Precision Server: will it live up to expectations? This is an experiment that may be a throwback to some older server version. The Dell Precision has matched 160GB drives so I could Raid 1/0 which is what I will most likely do. I am sort of tired of backing up to multiple machines at erratic intervals. NOTE: While trying to restore a couple of GX270 boat anchors, I looked at a whole bunch of IDE drives I had and guess what – there is a whole bunch of unique data from 2005 – 2010 time frame that exists no where else. OK, mpre data for the 2 TB drive I back up to. I did run the System Test and it passed OK but had some anomolies I did not understand with the memory valid areas. This is a later check out but at least the machine runs, seemly, OK. In the past I have been a scoffer at such stuff as alternative medicine. This is based upon my very conservative Midwest upbringing, a critical and conservative nature with a bit of mis-trust thrown in and finally a belief in the big business scientific process. I admit that you cannot just throw all the junk being made these days into the public realm with no authoritative confirmation that it has “some” value: With a worldwide audience of “ready-to-jump-for-anything” people there has to be a “control” of some sort but the with the national mania for “tag’em, bag’em, book’em” these days who can believe anything? Folks, there is a thriving counter-culture spending good money on things that merit some research and a modicum of “control”. So what does the term ORGANIC mean to you? It really means nothing at all, in any sense. I prefer the term “Naturally Grown” and this means that a seed can reproduce itself in the same exact form as its parents, year after year, without patent or other encumbrance year after year. Now, after that comes the “wild” label and this means it is free grown in the world, from its own seed, with no artificial means of support from human intervention, other than planting the seed, for 10 generations. I like the Wild label. I strived for that but finally caved to the $$$ and lack of familia support needed during the heydays of my farm days. So here I am at the end of my statement and wish that others will win. Here it is the day after the 4th of July. This is the day after the night before and when I slept soundly through the fireworks that I did not hear. This is the day after the early morning arrival of Abby, who jumped upon my bed and awakened me, and who disappeared almost immediately. This is the day that I could not go back to sleep after Abby Event. I got up and made some porridge, via a three minute burn in the microwave, and added pecans, raisins, cran-raisins plus local honey that I know came from fields nearby. While all this was melding together, the electric teapot was plugged in and water was boiled, cooled to proper temperature and added to two bags of Teatley English Breakfast tea in a very fine teapot. Breakfast was enjoyed on the back porch while being serenaded by birds of all sorts on this clear, cool day. I took the deck umbrella cover off and laid it aside so that I could deploy the umbrella and made it so. The morning sun was just filtering through the trees while I was enjoying my strong tea and Abby cavorting around the deck in her silent non-barking manner. While all this was happening, I noticed a green tree frog sittng in a nook on the adjacent deck chair. She was a pretty frog. Later in the morning I took the red but striped cover down to Little Yellow so I could cover the exposed boom that has the main sail attached. I adjusted a few lines and this helped LY to ride more naturally in her slip and left for the morning. Science fiction legend Bradbury wrote this as part of a 12-piece series for Esquire in 1951. Bradbury explores a world in which everyone has the same dream that the world would end, yet no one erupts in panic. Instead, the unstated end of the world lends a kind of calmness to society with everyone following their daily routines exactly as planned. The story leaves you wondering what exactly you would do if you knew the world was ending. Read it for free here.